On 19th March, The Rotary Club of Twickenham held its fourth annual Technology Tournament for local schools in the Richmond Borough. 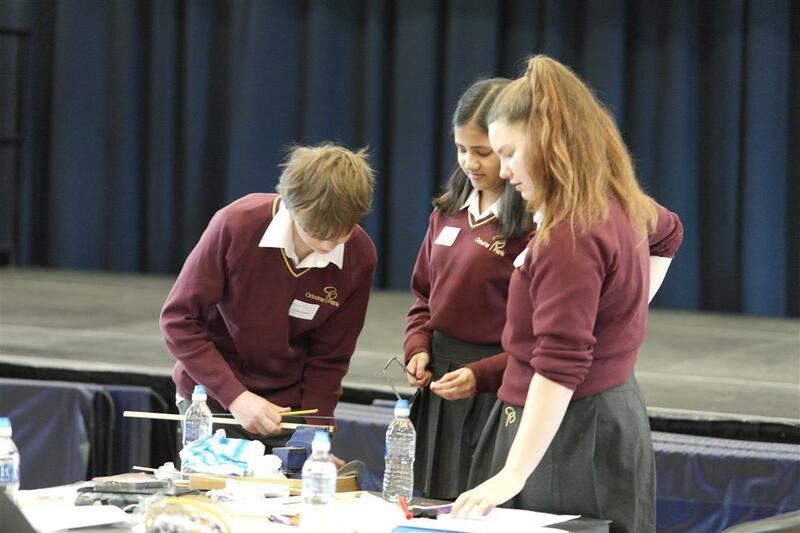 Once again schools in the borough were invited to enter teams of students to compete in solving a task which they knew nothing about until the day of the event and demonstrate their problem solving, planning and team working skills. The same basic task (to design and build a working crane to recover a container from a derailed truck) was set at Foundation, Intermediate and Advanced level and involved 76 pupils, working in teams of four. Not to be left out, the teachers joined in with their own mini tournament! Basic materials were provided including pieces of wood, pulley wheels, cardboard, paper clips, screws and an electric motor to power the crane and the results were judged on the basis of the best design, team working and success at the testing stage. At the end of the day a formal prize giving was attended by the Mayor, Ben Khosa. The event was supervised by. the five Rotary Clubs in the London Borough of Richmond upon Thames (Twickenham, Twickenham upon Thames, Richmond, Kew Gardens and Teddington and the Hamptons) and support was also given by the Rotary Clubs of Ashford, Middlesex, Woking District, Godalming Woolsack and Redhill, Reigate and District. District Governor David Easton and his wife Caroline from Chichester Priory Rotary Club were also in attendance. The winners of the tournament were Radnor House (Foundation), Orleans Park School (Intermediate) and Orleans Park School (Advanced). The winners of the Teachers’ Challenge were a mixed team from Orleans Park and Kings House School.